Posted in Bright Ideas / Research on December 2, 2017. You can read the 2018 report here. 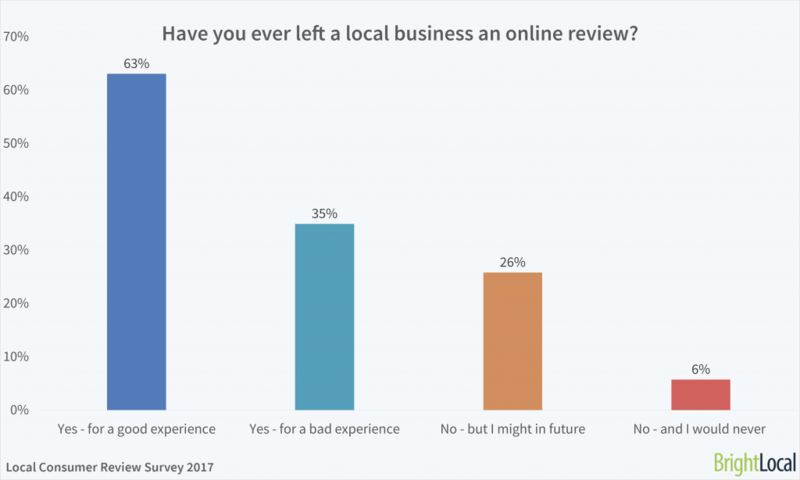 Since the introduction of the Local Consumer Review Survey in 2010, we’ve seen significant shifts in the ways that consumers seek out and use online reviews when choosing a local business. 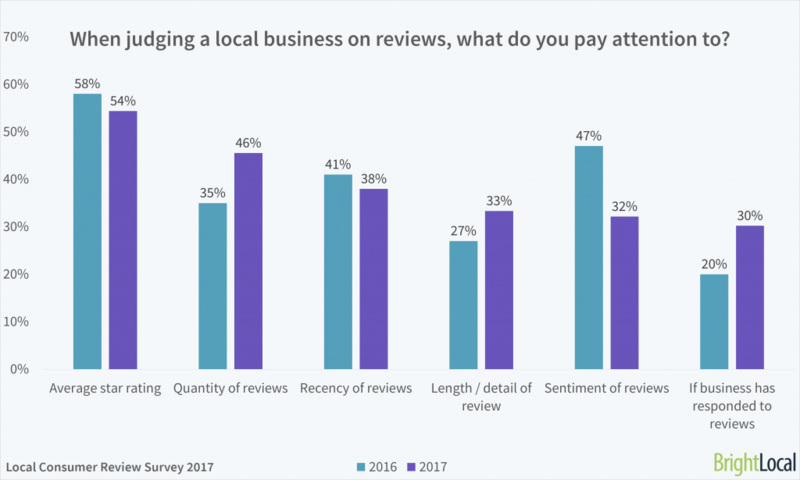 More people are looking for reviews than ever before, and we’ve found that nearly every consumer has searched for a local business online at least once this year. Consumers are becoming more review-savvy, preferring businesses that receive high volumes of high-scoring reviews on a regular basis. Consumers are also changing their habits regarding what they do after reading a positive online review. People are now less likely to go on to visit a business’ website straight away — but they’re far more likely to get directly in touch over the phone over via email, or by visiting the business. In today’s post-truth climate, in which the authenticity of online content can be questionable, trust is now a critical consideration. 79% of people have seen a fake review in the last year, but even more are likely to be bubbling under the surface, with 84% of consumers admitting they can’t always spot these. Which business types have you read consumer reviews for? Which popular review site is most trusted for local searches? What is the typical next step after you read a positive review? Have you ever been asked to leave a review for a local business? And did you? Is it easy to spot if a review is fake? Checking consumer reviews has become a key part of choosing a local business, with more consumers than ever turning to the internet for help with everyday decisions. Whether it’s choosing a new restaurant to visit as a tourist in a new town or finding a reliable plumber to fix a leak at short notice, reviews have become the way of life for nearly everyone. 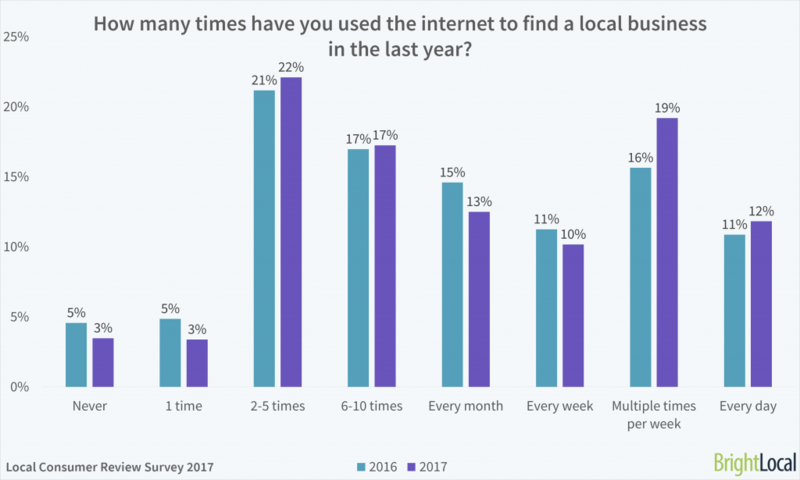 Nearly every consumer (97%) used the internet to search for a local business in the last 12 months – a slight increase from 2016, when 5% had not. 12% searched each day, up from 11% last year. 54% are now looking at least once per month – up from 52% in 2016, and 43% the year before. These incremental increases suggest consumers are seeking out local businesses more than ever. Nearly every consumer now conducts regular local searches, placing expectations on businesses to be visible online. Some businesses can struggle to differentiate from their competitors, so a positive online reputation is useful to help customers make a choice. In 2017, consumers continued to read reviews for each business type at similar rates as in 2016. Restaurants, hotels and medical providers again lead the pack as the sectors in which most reviews are read. A massive 60% of people read a review for a restaurant or café, 40% for hotels and B&Bs, and 33% for healthcare professionals. Here we see a clear correlation between regularity of service use and review-reading. How often we need to find a good nearby restaurant, grocery store or bar far outweighs the frequency that we need locksmiths, accountants and chiropractors, for example. It’s up to businesses to understand the behaviors that lead to the checking of reviews, and to make sure they have sufficient reviews to help consumers feel able to trust their service. If your customers require your service on a less frequent basis, it’s all the more important that you deliver a great service and encourage reviews, because it will be harder to push negative reviews down the page otherwise. The fact that you don’t need to be bolted to a computer to search for reviews means that finding a local business can be done anywhere — whether you’re planning a holiday well ahead of time on your home desktop or using your mobile Yelp app to find a quick place to grab a bite before a meeting. This ability to find reviews on the go has led to the growth of review-reading on mobile devices, but interestingly these haven’t replaced the viewing of desktop reviews; instead, they’re in addition to them. In fact, 80% of consumers used a desktop or laptop computer to read reviews, a slight growth from 78% in 2016, and 73% in 2015. The use of tablets and mobiles to read reviews has increased every year. This year, 32% opted to use mobile apps to find reviews — a huge jump from 18% in 2016. 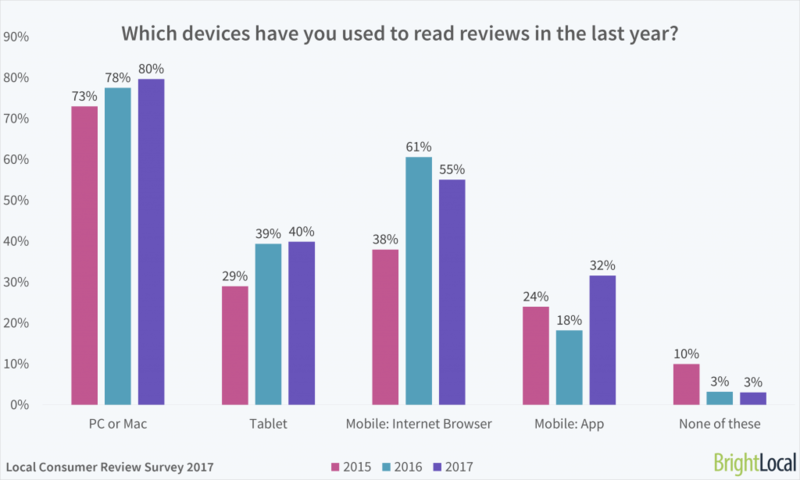 With those using mobile internet browsers slightly dropping by 6% over the last year, it seems consumers are moving towards using review sites’ own apps instead of searching for reviews via mobile browsers. Which popular consumer review site is most trusted for local searches? In a question new to this year’s survey, we asked consumers to pick their top review site from a selection of the most popular cross-sector local business review sites. Yelp and Facebook lead the pack as consumers’ most trusted review sites with 20% apiece choosing them as their favorite — followed by Google and BBB.org. With Yelp attracting 40.47 million in US traffic each month, and Facebook 85.57 million (as of October, 2017), it’s no surprise they are so respected. With Yelp’s status as a long-established review site, and Facebook’s unparalleled access into the lives of its billions of global users, Google is doing well to be the first choice for so many consumers, coming in third place with 16% of the popular vote. While it leads in monthly traffic, there is still some work to be done to cement it as the trusted source of second opinions. This will likely come as Google puts more emphasis on encouraging business owners to collect reviews and consumers to leave them. BBB.org is a surprise high-ranker, sitting just behind Facebook with 15% of consumers’ votes. Despite getting just 6.15 million monthly visitors (October 2017), the marketplace’s mission, ‘Start With Trust’, is clearly resonating with consumers. Trailing in the rankings is Foursquare, which is just 3% of consumers’ review platform of choice. After moving away from its consumer platform, Foursquare now focuses more on being a data provider with broader business services. Consumers have clearly noticed the switch and are placing their trust elsewhere. Could Foursquare reviews be close to the end? To read more about reviews on Google, Facebook, Yelp, TripAdvisor, and Foursquare, read our Comparison of Local Review Sites. *Consumers were allowed to select a maximum of two answers. Reading a positive or negative review is one thing, but what really matters is what the consumer does next. Do they take the review on board? Do they ignore it? Do they read more reviews? Do they take immediate action to use the business? On the one hand, 68% of respondents said that positive reviews made them more likely to use a business, which is a significant growth from 50% in 2016. However, the same conclusion can’t be reached when it comes to negative reviews. In fact, that number has decreased significantly in 2017, with just 40% saying they’d refrain from using a business after reading negative reviews, down from 68% in 2016. This trend corroborates with the findings in Q8, where negativity is becoming less of a driver. The results suggest that, while people are now more likely to take action after reading a positive review, negative reviews are less likely to put them off using a business. This is good news for businesses who already have a strategy in place for encouraging positive reviews and managing negative ones. This result may be an anomaly of this year’s panel, so take these findings with a pinch of salt and wait until 2018’s study confirms this trend before ignoring the importance of negative reviews. The past year has seen dramatic shifts in the actions consumers take after reading positive reviews. Consumers appear to be balancing snap decisions with online research, with a notable drop in those who continue to shop around after reading good reviews (17% in 2016 down to 10% today). While consumers aren’t as likely to head straight for the business’ website, they’re delving further into reviews, with an extra 7% of respondents saying they’d look for more reviews this year than in 2016. While visiting a business’ website remains the most common next step (37%), consumers are now more likely than before to get in touch directly. A significant 17% of consumers will now visit the business after reading positive reviews – a huge jump from 7% in 2016. And what’s more, 10% now contact the business as their next step — up again from 3%. One element that may have affected this change in 2017 is Google’s growing ability to replace the business website. With so much business information now available in SERPS and the Google environment (including opening times, location, bookings, Q&As, showtimes, and much more), the necessity of visiting a website is decreasing. Consumers are now more likely to connect in person (either by visiting the business or getting directly in touch) after reading positive reviews, so it’s never been more important to ensure the company name, address, and phone number is correct across the board. Businesses should ensure it’s as easy as possible for potential customers to call or visit the business after reading an online review; and keep a close eye on their website, review sites and further citation sources, such as directories, to ensure contact details are correct and consistent. Reputation checks are clearly a way of life when it comes to choosing a local business, as just 7% of consumers told us they don’t read online reviews. This means 93% do read reviews to determine the quality — with 35% of respondents consulting online reviews every time they look for a local business. A further 31% read them regularly, and 27% occasionally. Over the 7 years we’ve conducted this survey we’ve seen a steady rise in the number of consumers consulting reviews. In 2011, 71% of consumers stated they read reviews, rising to 78% in 2012, 85% in 2013, and now 93% in 2017. If such incremental changes continue, could every consumer soon be reading reviews as part of their decision-making process? 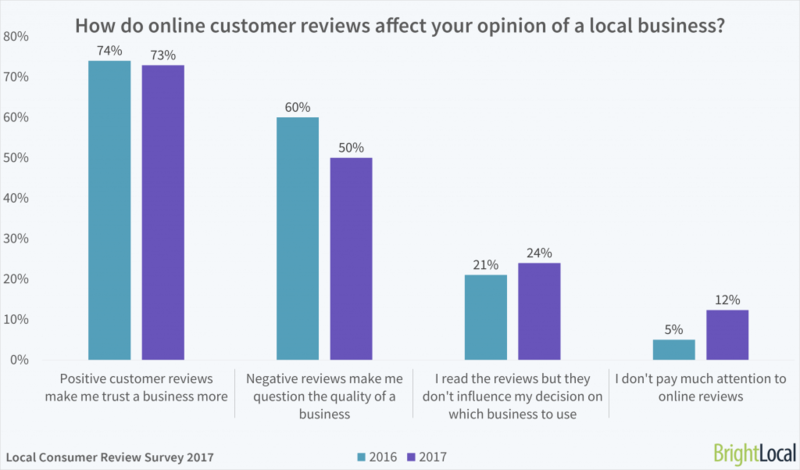 Reviews continue to play a key role in establishing the public reputation of a local business, directly influencing how consumers feel about a business. However, this year’s survey points to shifting attitudes among consumers. 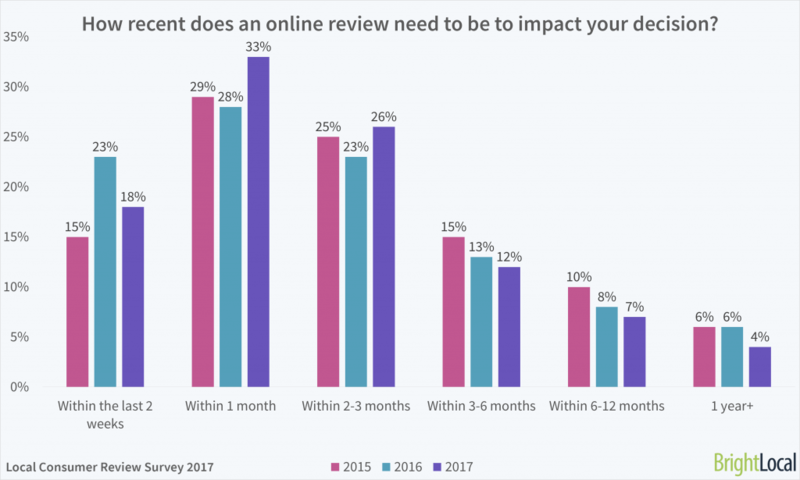 Even though more consumers than ever use online reviews, fewer believe they are letting reviews influence their opinions (12%, up from 5% in 2016) and 24% say they don’t pay much attention to reviews (up from 21%). Consumers are habitual review checkers, but many believe they’re savvy enough to decide for themselves what they want out of a local business. There also appears to be a growing level of apathy or lack of concern about negative reviews. This is evidenced by the fact that 73% of consumers said that positive reviews make them trust a company more, but a far lower 50% said that negative reviews made them question a business’ quality. This follows on from the trend of negativity seen above. Consumers are still looking for reviews to be recent, frequently submitted and with a high average star rating. However, in the last year, we’ve seen a bit of a shake-up in the importance of a review’s content. For example, in 2016 the sentiment of reviews was cited as one of the top two factors in a review (behind average star rating), but in 2017 it dropped into the position of fourth most important (47% to 32%). This surprising find suggests that the actual content of a review is becoming less important. This could be because time-poor consumers are moving away from fully reading reviews and are instead opting to make quick decisions based on the star rating and quantity of reviews. In Google (and some other influential review sites) full reviews aren’t immediately shown to the user, but average star rating and quantity of reviews are clear for all to see. This extra click to read reviews could be putting consumers off delving deeper and encouraging them to make decisions based on the summary information within search results. The growth in the importance of quantity of reviews (35% in 2016, 46% in 2017) certainly appears to back this trend up. 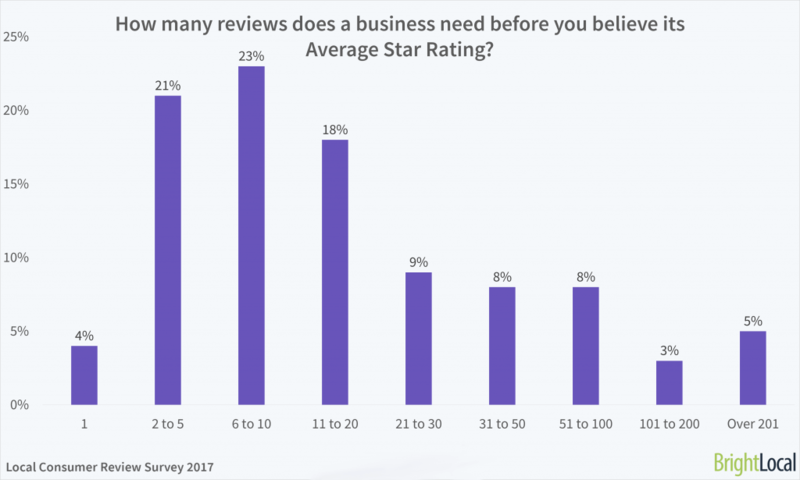 As seen below, the sheer quantity of reviews adds credence to star ratings, with consumers more likely to trust the average star rating of a business with many reviews. Star rating remains the most important part of a review, with 54% stating this as a key consideration. With consumers paying more attention to this than sentiment, businesses must consider what they can do to earn that coveted five-star reputation. More consumers are placing importance on businesses responding to online reviews, with 30% naming this as key — compared to just 20% last year. This leap shows the growing importance of responding to reviews quickly and professionally, addressing any negative comments with further context or information on how the criticism has led to change. This public show of appreciation or concern speaks volumes about a business’ focus on the requirements of its customers. 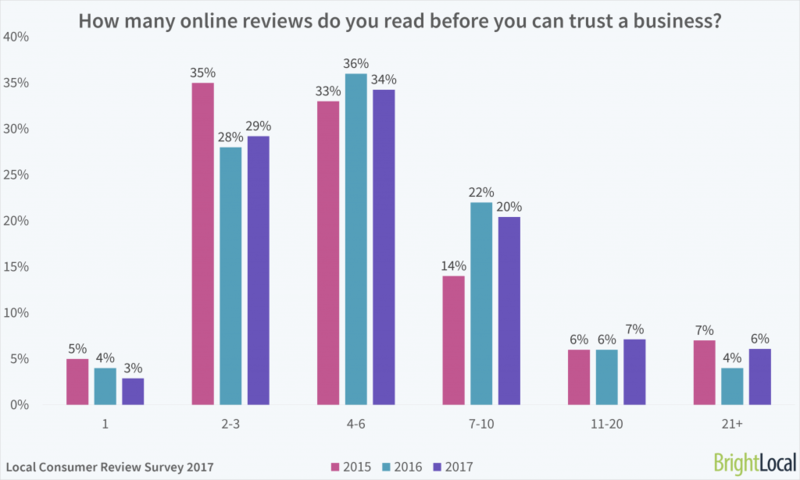 On the whole, trends around trust and the number of reviews read have remained consistent with last year’s findings, with small shifts towards consumers reading more reviews. This is likely to be tied to the growing number of consumers who expect businesses to have a significant number of online reviews (see Q9). 13% read more than ten reviews before feeling confident about a business — a small increase from 10% in 2016. For the second year in a row, 68% of consumers read four or more reviews before feeling they can trust a local business. Meanwhile, 3% of survey respondents read just one review to make up their minds, showing that the vast majority of consumers (97%) do further research before placing their trust in a nearby supplier. The average consumer reads 7 reviews before they feel able to trust a business — one more than in 2016. Following on from a jump in 2015-16, even more consumers are now expecting high average star ratings before using a business. 87% expect three or more stars, and an ambitious 9% wouldn’t touch a business unless it scores the full five stars from customers. Now 48% want a least a four-star rating (up from 45% in 2016 and 28% in 2015) — an increase of 20% in just two years. Today more people than ever expect a business to have a 4+ star rating. Whether this trend continues and even more people expect 4+ stars, or if this marks the new status quo for star rating expectations, remains to be seen. One thing’s for sure, though: for today’s discerning customers, there’s no space in their lives — or wallets — for businesses with low star ratings. Just 4% of consumers would consider a business with one star – a significant fall from 13% in 2015. A poor customer experience could bring the average star rating down, which could lead to a business being automatically blacklisted by a significant number of consumers. Keeping on top of reputation means regular checks on ratings across different review sites. Businesses must build a proactive plan to encourage positive reviews if they want to ensure potential customers are not put off. How many consumer reviews does a business need before you believe its Average Star Rating? While consumers tend to read multiple reviews to decide whether to trust a business, they expect it to have many more before trusting the accuracy of its average star rating. With star rating being the most important factor in a review profile (see Q9), it’s critical this is backed up by volume. However, in most cases this volume doesn’t have to be extreme – only 5% of consumers expect businesses to have over 200 online reviews before trusting the star rating. The average consumer expects to see 34 reviews before feeling able to trust the accuracy of a business’ star rating. And what’s more, 16% of consumers require 50+ reviews before trusting the average star rating. While a relatively small proportion of consumers expect to see a large number of reviews, failing to meet such expectations could mean losing out on a significant chunk of potential customers at the first hurdle. It’s no surprise that just 4% are happy to trust the star rating on just one review. Consumers generally expect businesses to acquire reviews regularly, so those that struggle to get these may risk people losing trust in them. Potential customers could also be turning to competitors with a higher quantity of online reviews that back up the trustworthiness of the star rating. With ‘recency’ cited as the third most important factor of reviews (see Q9), it’s wise to look carefully at a review’s shelf life. Our study found that 77% of consumers believe reviews older than 3 months are not relevant anymore and don’t consider these in their decision making. There is a clear trend here, with this figure rising from 73% in 2016 and 69% in 2015. Just 4% of consumers would take a review older than a year into consideration when making a decision. Consumers expect to see a significant number of reviews in order to trust the average star rating, and therefore to trust the business. But even once this pot of reviews has been established, businesses can’t rest on their laurels. With recency being a key concern for consumers, keeping the volume of recent reviews high and the average star rating glowing is an ongoing process and requires considerable effort to achieve. While people would once just tell friends and family about their experiences with local businesses, it’s now the norm for people to share these opinions more widely online. A significant 85% of consumers trust online reviews as much as personal recommendations if they meet criteria such as the number of reviews or type of business. This has risen from 84% in 2016. 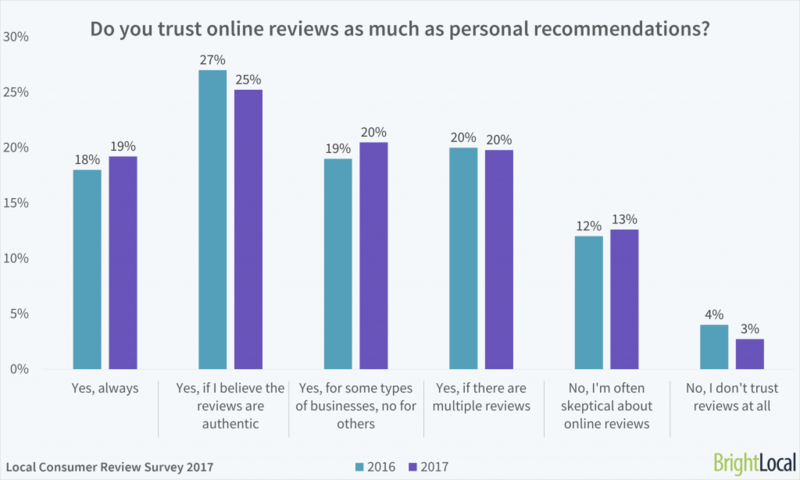 Just 15% of respondents said that they trust personal recommendations more than consumer reviews, with 12% of these skeptical about online reviews. 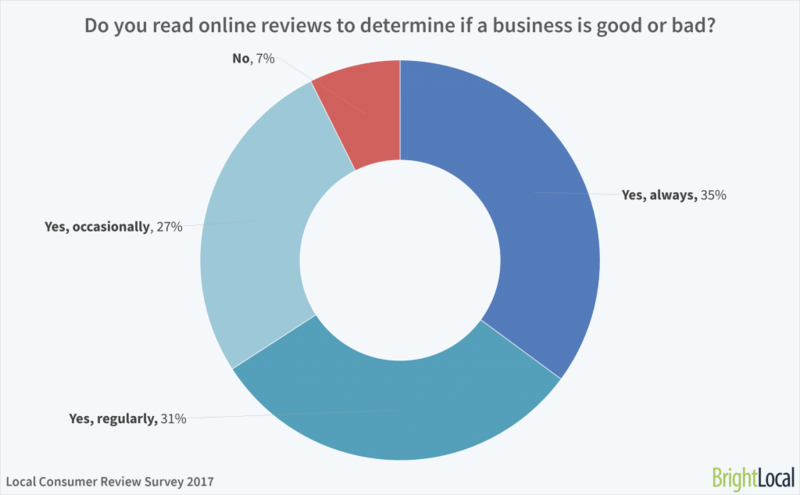 This shows that although trust in reviews is at an all-time high, review platforms need to do more to encourage faith in review scores and convince this minority that reading reviews is a reliable way of assessing the quality of a business. 20% of respondents are only willing to trust reviews as much as their peers’ endorsements if there is more than one review present. A further 25% only trust reviews as much as recommendations if they believe they’re authentic, meaning a significant number of consumers are suspicious of the validity of claims made online. For consumers to continue to trust online reviews as much as the recommendations of peers, the top review sites must focus on building an unbiased base of reviewers, and react quickly to those posting inauthentic reviews. Businesses, too, can limit the impact of unjust or false claims by closely monitoring reviews. This enables them to react more quickly, taking all feedback on board politely and professionally, and notifying review platforms of any fake reviews found. Our survey finds that the majority of respondents both read and leave reviews for businesses. Just 6% stated that they have never, and would never leave a local review, but an encouraging 26% but would consider it in the future. It’s often said that you’re more likely to share a bad customer experience than you are a good one. However, today it appears that positivity is the key driver of local business reviews, with 63% of consumers having written a review for a good experience in the past. But it’s not safe to assume that poor service won’t lead to bad reviews, as a significant 35% have left reviews after a negative experience. One of the key findings to acknowledge here is that just over a quarter of respondents are in that middle place of not yet having left a review but being open to the idea. These are the people businesses could benefit from by employing a strategy for requesting reviews. Have you ever been asked to leave a review for a local business? Although the first priority for businesses will always be to provide an exceptional service, it’s becoming increasingly important to encourage people to share that experience online. Businesses are becoming more willing to ask for reviews, with 74% of our survey respondents saying they’d been asked to leave a review for a business — up from 70% in 2016. 68% of consumers who were asked to leave a review by a local business did so in 2017. However, with 26% still never having been asked for their feedback, it’s a case of “Don’t ask, don’t get” for many businesses. This data suggests that local businesses should ensure they fit review requests into the customer journey. Not every happy customer will think to leave a review after purchase, so it’s up to businesses to make sure they remember to ask. To access this crucial 68% who will leave a review when asked, recognize when a customer is happy with your service, and follow up appropriately to direct them towards your preferred review sites. 2017 has seen ‘fake news’ become the topic du jour, with claims that we’re in a ‘post-truth’ era making it harder to know what to believe on the internet. For the discerning consumer this has stretched to reviews, with people becoming more skeptical of the intent behind the sentiment. Fake reviews (as in, online reviews left by the business itself or its connections, paid-for reviews, or reviews left by ex-employees or competitors that don’t accurately reflect the business experience) have widely been acknowledged as a problem when it comes to maintaining a positive reputation. In particular, it’s been documented that review sites don’t treat fake reviews as a priority, and the complexity of getting them removed has left many business owners scratching their heads. Our data illustrates the extent to which fake reviews are a problem. 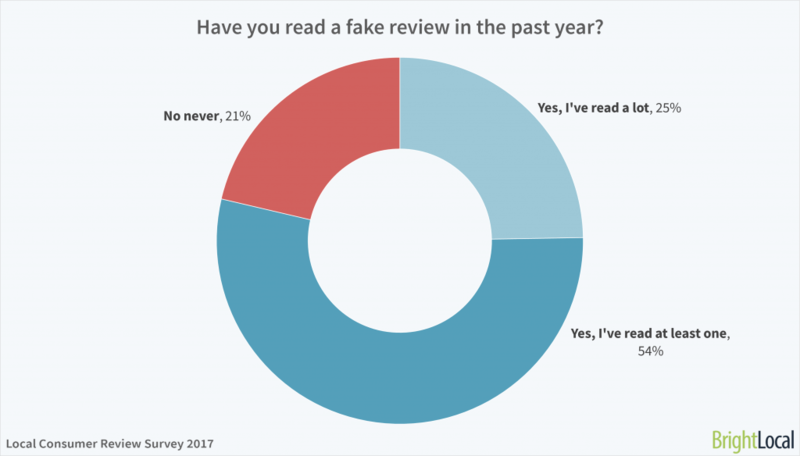 79% of consumers say they’d read a fake review in the last year, with 25% saying they’d read ‘a lot’ of fake reviews. Coupled with the high level of trust that consumers place in reviews, businesses and review sites face a serious challenge in weeding out or preventing fake reviews. Despite the abundance of fake reviews, a worrying 84% admitted they couldn’t always spot one. 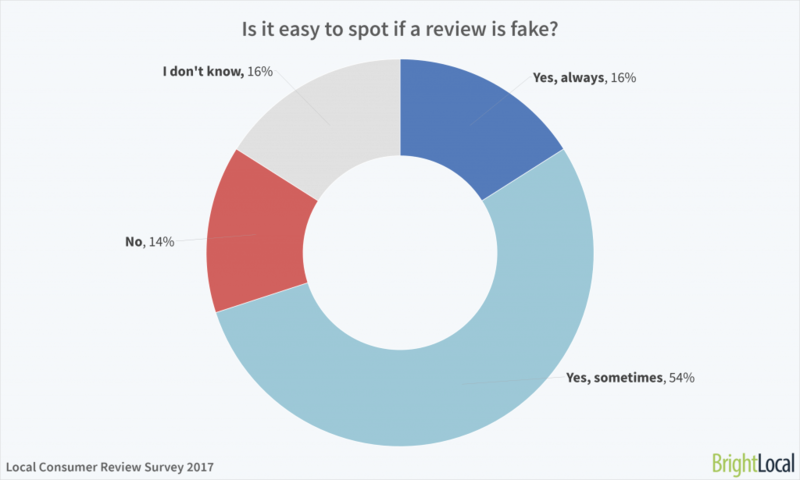 While 70% did think it was normally possible to spot the authenticity of a review, any fake reviews that slip through can easily lead to consumers getting an inaccurate portrait of the business. Whether they’re paid-for-reviews making a business look better than deserved or damaging reviews written by people intending to cause harm, these fake reviews could have dramatic ramifications on the fortunes of local businesses. And with more people than ever expecting high star ratings (Q11), even one rogue review could cause businesses to drop out of favor. For the 14% of people who admit that they can’t ever spot fake reviews, and the 16% who don’t know how to identify them, fake reviews could create considerable problems when assessing the authenticity of a review. Further education of review site users is required to help them feel able to spot fake reviews — with the onus on businesses to monitor their own profiles to tackle inaccuracies before they can cause damage. 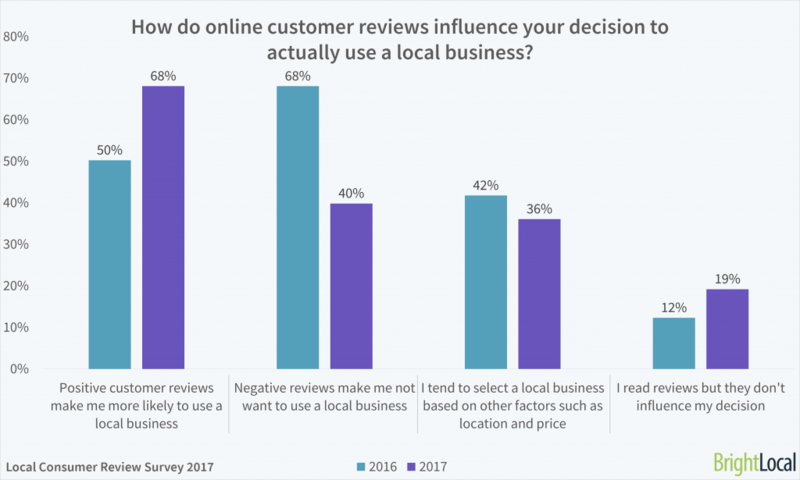 Our 2017 study follows on from 2016’s, comparing the most telling insights on online local business reviews to see how they’ve evolved, and to provide useful importance of reviews statistics. It also includes new and modified questions that fit into the key SEO and local review trends we’ve seen this year. The statistics and findings are solely concerned with reviews for local business services and not general product reviews. Based on the views of a representative sample of 1,031 US-based consumers, this survey was conducted in October 2017 with an expert consumer panel. When analyzing data on those who have read consumer reviews, we have removed respondents who don’t read reviews. Averages for statistics in Q10 and Q12 are based on the midpoints of each banding. We compare this year’s results with those in 2016 and 2015 to show how trends have changed over time. For questions about the report or to speak with a member of the BrightLocal team, please contact content@brightlocal.com or leave a comment below. Publishers are welcome to use charts and online reviews statistics crediting BrightLocal and linking to the report. Thanks for reading this year’s Local Consumer Review Survey — if you’ve got any thoughts or questions on what these statistics mean for local businesses please let us know below.